Both companies have recorded strong gains on the market this year, but one of them could fall behind the other. 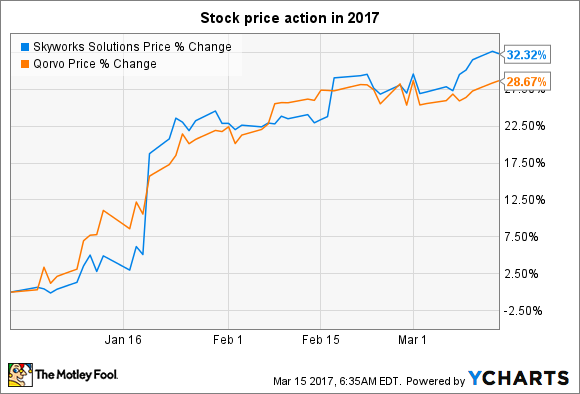 Apple (NASDAQ:AAPL) suppliers Skyworks Solutions (NASDAQ:SWKS) and Qorvo (NASDAQ:QRVO) have been on fire this year. Shares of both companies are up around 30% in 2017, thanks to the iPhone 7 production cycle and the growing popularity of Huawei's smartphones. The two semiconductor specialists are known for making connectivity chips used in smartphones and Internet of Things applications, but one of them is ceding ground to the other due to stiff competition. Here's what investors can expect from Skyworks and Qorvo going forward. Skyworks Solutions has been busy diversifying its revenue streams, as it relies on the iPhone maker for an estimated 40% of its business. As it turns out, Huawei is now its second-largest client, while it also supplies chips to other Chinese smartphone companies such as Oppo and Vivo. Skyworks' aggressive pursuit of fast-growing Chinese smartphone players has reaped dividends as its second-quarter guidance turned out to be better than expectations. More importantly, the company has been churning out China-centric products -- such as a front-end LTE solution -- to tap the country's fast-growing LTE smartphone market. Skyworks' focus on China will be a long-term catalyst thanks to rapid LTE adoption in this market. For instance, the region's LTE subscriptions shot up 84% last year, outpacing global growth of 64%. According to GSMA Intelligence, China's LTE subscriptions will continue growing at a fast pace, reaching 1 billion users this year from 762 million in 2015. GSMA Intelligence forecasts that 70% of LTE users in China will be on the TD-LTE network, which Skyworks is looking to tap with its recently launched SkyOne Ultra 2.5 product family. Therefore, the chipmaker is pulling the right strings to grab a slice of this market, as smartphone shipments from the top 10 Chinese smartphone makers could jump 39% this year. Apple's next iPhone, meanwhile, could provide another catalyst for Skyworks. Mizuho analysts Vijay Rakesh and Jason Getz recently upgraded the stock based on its ability to benefit from a strong iPhone production cycle. The Mizuho analysts forecast that Apple will manufacture 120 million units of the upcoming iPhone, compared to 89 million units of the iPhone 7 and 7 Plus. Skyworks is also gaining traction in automotive: It has won spots at Volkswagen, Samsung, and a "leading U.S. electric car OEM." For instance, LG Electronics is going to use eight chips from Skyworks to power location-based services and Internet of Things applications in Volkswagen cars. Samsung, on the other hand, is using its chips for remote diagnostics applications. In all, Skyworks is spreading its wings in all the right places to ensure long-term growth. Qorvo shares might have shot up impressively this year, but the momentum may not last long. The company's fourth-quarter guidance of $630 million in revenue was way below the Wall Street forecast of $719 million, thanks to delays in smartphone production ramp-ups by its key customers. In his prepared remarks, Qorvo CFO Mark Murphy said that the outlook suffered as "two of our leading customers in China and a tier 1 customer in Korea delayed flagship smartphone launches," pointing at the Samsung Galaxy S8's late launch. The Chinese client probably refers to Huawei, which contributes 11% to Qorvo's top line. However, Qorvo's weak outlook as compared to a strong one from Skyworks suggests that the latter could be winning market share, since both companies have some of the same clients. Skyworks, for instance, supplied all of the radio-frequency chips in Huawei's flagship smartphone last year, and supplied three chips to Apple versus Qorvo's two. A Barron's report suggests that Skyworks is winning content at Samsung, while its RF design wins at Huawei could encourage other Chinese smartphone makers to follow suit. The company's management corroborates this possibility: CEO Liam Griffin said Skyworks has been gaining content in multiple Samsung devices, apart from key wins at Chinese smartphone companies. Qorvo, therefore, could be losing business to Skyworks. 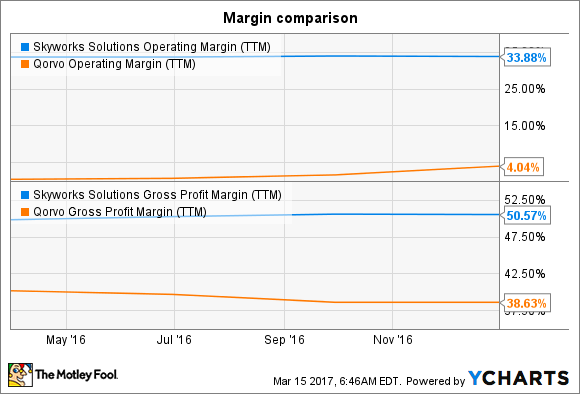 SWKS Operating Margin (TTM) data by YCharts. More importantly, Skyworks has a debt-free balance sheet and a stronger cash position of $1.35 billion. This compares favorably to Qorvo's debt of just under $1 billion and $495 million in cash, indicating that Skyworks can spend more money to capture market share through innovation and marketing.